Installation is easy, at least on the latest LTS version of Ubuntu (Trusty, 14.04) which we used for our tests. and you can enjoy your new software - proxy is installed into the /usr/local/skysql/maxscale directory. Once installed, we need to configure it. Along with installation comes an example configuration file, located in: /usr/local/skysql/maxscale/etc/MaxScale_template.cnf. It gives a nice introduction to the available options, and helps to setup the environment. MaxScale uses a pluggable architecture with different plugins providing different features. In this post, we will concentrate on the routing part, and for now, leave out other interesting possibilities like query rewriting. MaxScale uses different types of services; monitors, services, listeners and filters. ‘router=readconnroute’, which provides round-robin-like (RR) kind of access. Each service was accompanied by a listener, port 3307 for RW split and 3308 for RR service. With RR service, we relied on MaxScale’s monitoring of Galera nodes to route connections only to the nodes in a ‘Synced’ state. There are couple of interesting bits in the configuration file. As you can see, we had to define user/password pairs several times. Those users are used to check the health of the MySQL nodes and to get access to the list of users defined in the system. For the sake of simplicity we used plain text passwords but it is possible to use hashed passwords for better security. Finally, since we wanted to compare performance of MaxScale vs HAProxy, we used HAProxy installed from within ClusterControl in a default setup – configured similarly to MaxScale’s RR service. 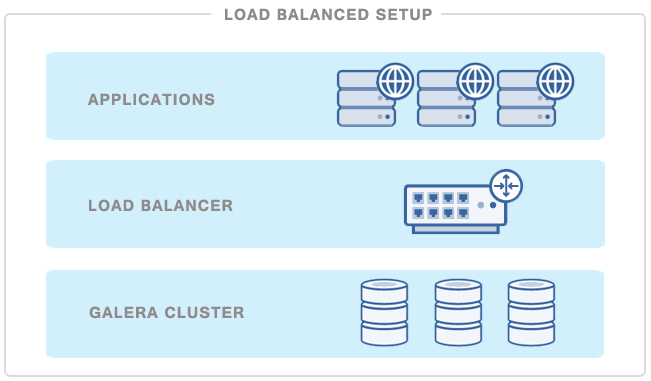 How does MaxScale work with Galera Cluster? So, let’s talk about how MaxScale sees the Galera Cluster. MaxScale provides an admin CLI which gives you access to some internal statistics. After the first login (user admin, password skysql), you can check available options by running the ‘help’ command. One of the very useful commands is ‘show servers’, which returns a health status of the cluster. Below is the example output of that command. It means that, at any given time, connections can be routed to any of the nodes, as long as they are in the ‘synced’ state (i.e. not serving as a donor or joining the cluster). On the other hand, the RW service was looking for ‘Slave’ and ‘Master’ states to route traffic accordingly. In case of a master failure, a new node is elected as a new master. Your application needs to reconnect though, MaxScale currently does not provide failover for currently open connections. Another interesting bit is the ‘master’ failover part – when MaxScale detects that a node, elected as a master, is unreachable, it promotes one of the ‘slaves’ to the ‘master’ role. Then, by default, when old ‘master’ comes back online, it is immediately promoted to its old master role. As a result, writes may switch back and forth between different nodes should the ‘master’ start to flap. You can switch this default behavior by adding ‘disable_master_failback=1’ directive to the definition of the monitor service. Stay tuned for part two of this post where we will cover the performance comparison between MaxScale’s different router services and HAProxy.